The Guardian frigate, commanded by Lieutenant Riou, surrounded by islands of ice in the South Seas, on which she struck 24th December 1789, in her passage to Botany Bay, with the departure of the crew in the jolly boat, Carington Bowles, 1790, Yale University Lewis Walpole Library. The long title of the piece sums the event up rather nicely. While traveling to Australia with supplies and convicts, the HMS Guardian struck an iceberg and nearly sank. 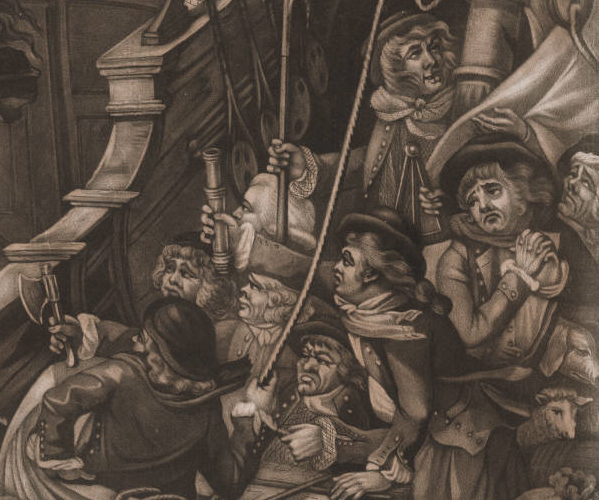 Her crew piled onto the boats to make their escape. Bowles has crammed as many tars as he could possibly fit into the piece, and so we have a lot to see! At the center of the piece are two officers. The central figure, gesturing up to the heavens, is Lieutenant Edward Riou, captain of the HMS Guardian. 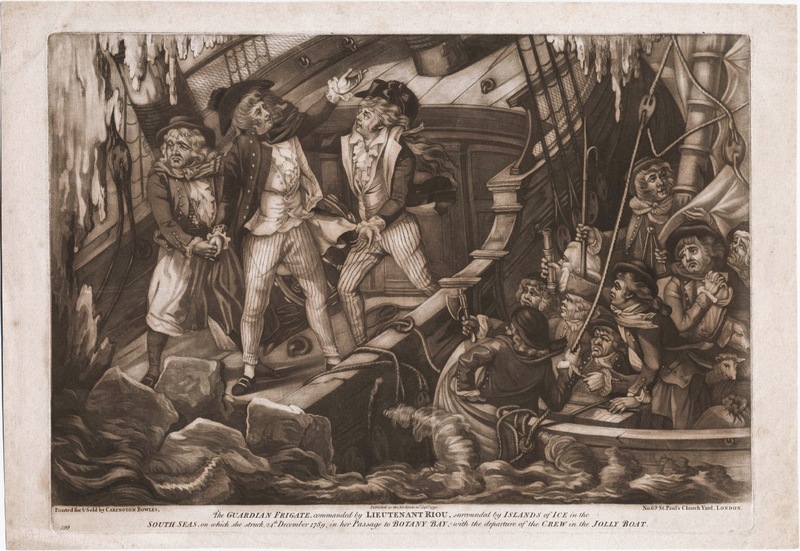 Remarkably skilled and undeniably gallant, he allowed most of the crew and their convict passengers to load into the boats, while he and a skeleton crew saved the vessel, navigating the crippled and barely afloat craft nine weeks to safety. Riou would later be killed at the Battle of Copenhagen, meriting his commanding officer Horatio Nelson's praise. At the far left, and clasping the hand of Captain Riou, is a common tar. He wears a round hat with a short, floppy brim, a solid colored neckcloth, a short jacket with metal buttons and open slash cuffs, a waistcoat with narrow horizontal stripes, plain slops, and dark colored stockings. In the jolly boat are the rest of the crew. In the bow and clutching a line is a tarpawlin with a jacket and open slash cuffs, a solid colored neckcloth, and a round hat with a narrow brim, just like his mate aboard the sinking vessel. Directly behind him is a chap in a knit cap. Further astern and looking rather surly (perhaps because he is sandwiched between everyone else) is a Jack with a checked shirt, white neckcloth, no waistcoat, a round hat, and a short jacket with metal buttons and open slash cuffs. With an arm outstretched, bearing a spyglass, another mariner is clad in the same jacket and round hat as all the others, save for the waist pockets on his jacket. He too is without a waistcoat. Clasping his hands in prayer is a jacket with a double breasted jacket with metal buttons and turned back cuffs (rather than the usual mariner's or slash cuffs), a darker neckcloth, an open waistcoat, and a round hat. Our last sailor doesn't seem too terribly perturbed by all of this, and happily holds the mast in one hand, and a boat hook in the other. He wears a checked shirt, what appears to be a striped neckcloth, short jacket with metal buttons, and short brimmed round hat.